Rebecca Molayem Gallery is pleased to announce Yari Ostovany’s first solo exhibition with the gallery. “Atmospheric Abstraction”, reflects a personal journey of exploration into the realm of the spiritual through the alchemy of paint, color, light, texture and the poetics of space. Ostovany approaches paintings as the visual evidence of, and not a report on, an experience; not a representation of spiritual energy but a translation of it into light and texture, navigating the space between stasis and movement, emergence and disappearance. The trajectories in contemporary painting in which his work belongs range from Abstract Expressionism in the west to Persian and Taoist/Zen sensibilities in the east and other perennial visionary paths of wisdom. Born in Iran in 1962, Yari Ostovany moved to the United States at the age of 16 and pursued his studies in Art first at the University of Nevada – Reno and then at the San Francisco Art institute where he received his MFA in 1995. Ostovany has exhibited extensively in the United States and internationally, and is the recipient of Sierra Arts Endowment Grant, Craig Sheppard Memorial Grant and Sierra Nevada Arts Foundation Grant. Recent solo exhibitions include Stanford Art Spaces at Stanford University, Vorres Gallery in San Francisco and Aria Gallery in Tehran, Iran. 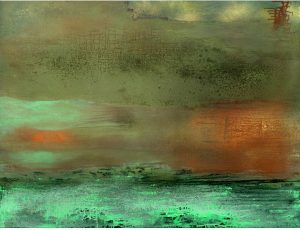 His work is in the permanent collections of institutions including the New Britain Museum of American Art in New Britain, Connecticut, Pasargad Bank Museum in Tehran, Iran, Permanent Collection of the University of Nevada – Reno Art Department and is represented by Foundation Behram Bakhtiar in France, Artscoops in Lebanon, Brave Art Consulting in Santa Fe and Art Represent, Emergeast, and Ideal Art in London UK. Yari Ostovany’s luminous abstractions, with their mists of colored vapor dispersed here and there by soft-edged vistas of paint drips running at right angles—the Cubist grid as orthogonal precipitation—may remind viewers of the charge leveled in the early nineteenth century at Turner’s effusions or even explosions of color, “paintings of nothing or very like.” Abstraction is now the orthodox style of a half century ago, but Ostovany’s free, experimental approach is irresistible, and gives the genre, which has had its facile practitioners, new life and immediacy—and numinous, transcendent meaning.